Located about 27 miles southeast of Bend, Newberry Group Campground is the only exclusive group area available on Newberry Monument. 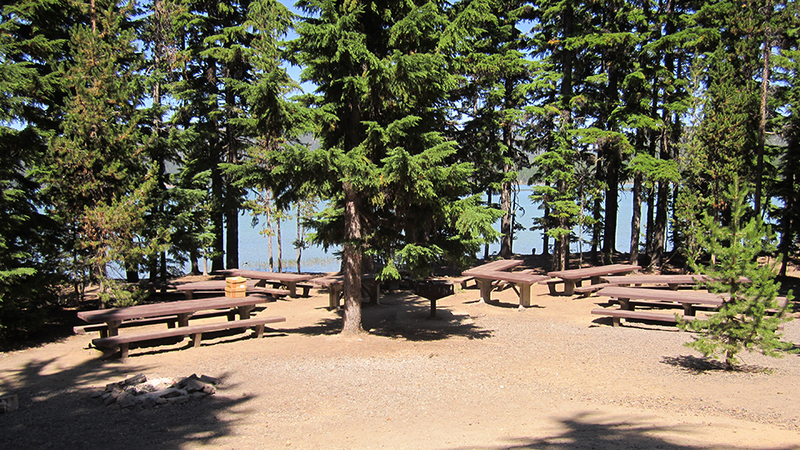 The campground is situated along the south shore of Paulina Lake within the Newberry National Volcanic Monument, which includes 54,000+ acres of lakes, lava flows, and spectacular geologic features in central Oregon. Newberry is both seismically and geothermally active; geologists believe the caldera sits over a shallow magma body only two to five kilometers deep. Visitors can see numerous cinder cones and vents (over 400 throughout the area), miles of basalt flows, as well as rhyolite flows of obsidian. The area in and around Newberry Group Campground also offers opportunities for bird watching, bicycling, sightseeing, lake and pond fishing, and access to Paulina Lakeshore Trail #3955. The parking area and roads are paved, and the group sites are separated from one another, but it is easy to join the group sites, B and C especially, and the whole campground can be reserved as well. The per site fee schedule is as follows: Site A: $75 per night, sites B or C, $100 per night, or all three sites, $225 per night. Amenities include potable water and vault toilets, and there is a dump station at the nearby Paulina Campground with a fee of $10. Newberry Group Campground is typically open from early June to late September; please check website for current dates and for reservations.